Knowles brand DLI is one of the world’s oldest and most respected names in single layer, ceramic capacitor technology. With one of the largest in-house portfolios of dielectric materials, custom engineered solutions are available for unique customer (specification) needs. Circuit designers and engineers turn to two of its cataloged products, Bar Cap® and Gap Cap® for decoupling, RF Bypassing and DC blocking applications. 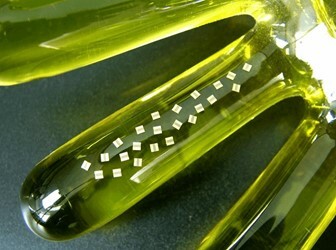 Bar Caps® are multiple Decoupling/Blocking Capacitors configured in a single array. They are specifically designed for MMIC circuits and RF Bypassing requiring multiple capacitor applications, such as Multiple Decoupling or RF Bypassing Networks. Due to their High Q and low inductance, these multiple capacitor array devices have become an integral circuit component. Bar Caps® can be integrated into an IC package to reduce bond wire lengths and leading to improved performance and simplified assembly. The result is reduced complexity and lower production costs. Operating at frequencies up to 30GHz they are ideal for DC Blocking, RF Bypassing, Decoupling, and GaAs IC’s. They are supplied with 100μ” gold metallization, with a Ni Barrier Layer, for wire bonding. Standard and custom package sizes are available to provide different capacitance values. Gap Caps® are series configured precision Capacitors for Microwave Applications such as DC Blocking and RF Bypassing where their low insertion loss and high resonant frequencies make them ideal devices. This product's unique recessed metallization configuration eliminates the need for wire bonding up to 100GHz and minimizes the potential of shorting during epoxy or solder attachment - therefore reducing performance variations. Capacitance values are available from 0.2pF to 800pF and, operating at frequencies up to 30GHz, they are ideal for DC Blocking, RF Bypassing, Filtering, Tuning and Coupling. Customized solutions are available alongside catalog product. Dielectric Laboratories (DLI), Novacap, Syfer Technology and Voltronics came together to form a single organisation, Knowles Capacitors – they have now been joined by Johanson Manufacturing. This entity has a combined history exceeding 200 years and is a division of Knowles Corporation of USA, an independent publicly traded company.